It's been a while since my last post in this blog, but please check out my other updates on MJ Facebook page and Youtube channel. I'll do my best to add more interesting post to this blog. Since it is close to Christmas, here is a sweet Christmas story with related videos to complete this heart warming MJ story. Have a good Christmas and New year! Let's also pray for Philippines' recovery from the recently disaster by Typhoon Haiyan. Michael Jackson was in Manila for a two-day concert that was part of his history world tour in December 1996. 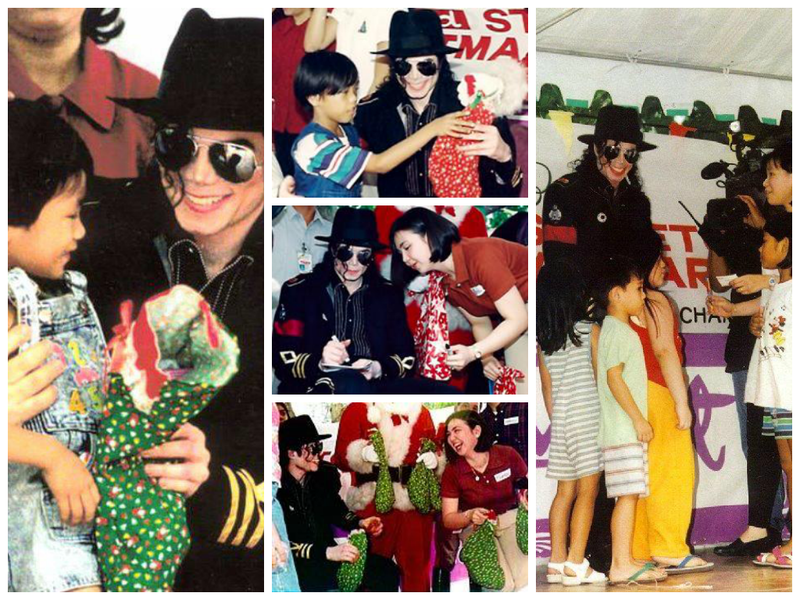 His one week stay at the Manila hotel became truly memorable when he volunteered to help in making some 300 orphans happy, as all children should be, on Christmas. Carino(former PR officer of the Manila Hotel) fondly recalled the festive mood Jackson created when he himself offered to fill and give away loot bags for all the children at the party. "Oh wow, the kids were definitely happy! They were overwhelmed," she narrated. "We never announced that Michael Jackson would be our special guest so you can just imaging how wonderfully surprised they all were. It's like a dream come true for them." Michael was very considerate to their requests to sign autographs and pose for photos," Carino recalled. "I remember a little girl who came up the stage for the second time and one of the guards sort of stopped her, saying that she alreay received her goodie bag. "Michael felt for her embarrassment and said, 'Oh it's alright, Sir. I forgot to give her a big hug earlier!' I thought it was really sweet and sensitive of him." And out of the many good things Jackson did that day, nothing beats the moment when he came back after getting whisked off the stage by his aides and bodyguards. "He went on the stage again to say thank you for allowing him to share such special time with the orphans. It was an incredibly genuine, moving and magical moment," she noted. 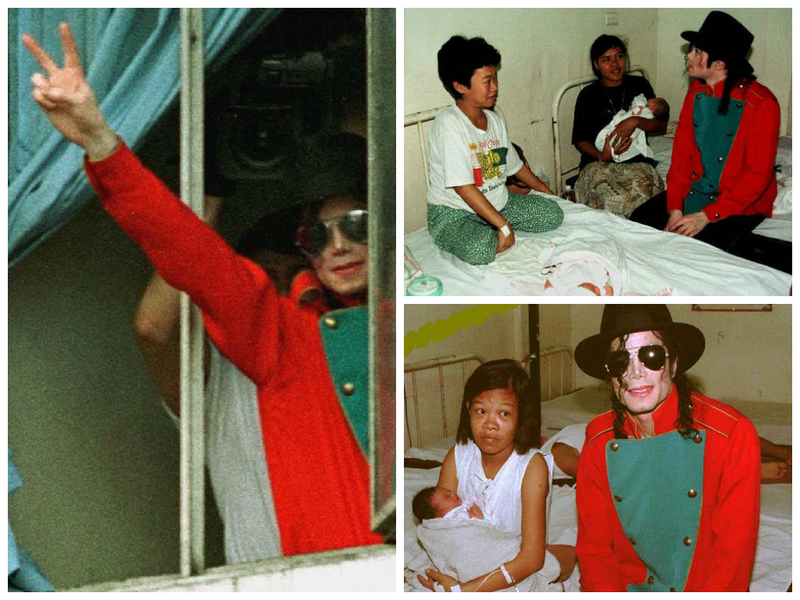 "I think Michael just simply had a big heart. He sought ways to make people happy. Unknown to many, on his way to the hotel when he arrived, he got off his van a couple of times on the road just to shake hands with street children along Roxas Boulevard. "According to his bodyguards Wayne and Yannick, he gave them a difficult time because he got off three times and the crowd became too large that he had to content himself by waving from the window," Carino said. "There's obviously another side to the man that a lot of people did not get to see, which is very sad." Carino added. The staff members of the Manila Hotel were indeed lucky to witness up close and personal this other side of Jackson. They were moved not only by his slick dance moves and catchy songs but by his unbelievably generous spirit and friendly demeanour. When I was a public relations officer at Manila Hotel, I was assigned to head the annual Orphan's Christmas Party where 300 children from different orphanages around Metro Manila were treated to a day of fun and surprises. It was one of the biggest projects on my plate and it was such a challenge to focus on work the day before the big event, knowing Michael Jackson was billeted in the hotel. Two nights before, I had been fortunate to be part of his welcome line at the hotel lbobby together with the rest of the PR and sales staff and saw him walk by. The day before, a guy claiming to be Michael Jackson's aide from Mamarao Productions came to the office. I couldn't recall his name but he looked for the "person in charge" and said his boss had read the announcement about the event in the Dear Guest flyers we had circulated to all the rooms a week before. Michael wanted to know how he could help. His aide went up to the Penthouse and down to the PR office several times after we gave our suggestions. Michael offered to fill up the 300 loot bags with goodies and toys, candies and chocolates. But after getting close to 50 sponsors, it was actually a problem for us to dispose of everything. So I thought hard... how can the King of Pop meaningfully join the affair? I couldn't possibly have him be with the kids in the palayok game or the pabitin as might end up being mobbed! And since the annual event was really about giving, I mustered all my courage and told the Mamarao guy that the best thing I could think of was for Michael to literally be present to help distribute the loot bags, sign autographs and pose with the children for photos. "Wow, that may not be easy. you're talking about handing goodies bags to 300 children and I can just imagine the chaos. We'll see. I'll get back to you," he said. Lunch break came and it was the most hurried one I ever took in my life. It wasn't until after 5 p.m. that Michael's aide came back and said, "Michael is more than happy to do whatever you suggest. How do we go about it tomorrow? I wanted to scream. I had to calm myself and regain composure as the Lizzie Maquire in me said, "Get real, get back into focus." We agreed that Michael would come in after the games, musical program and snacks, at the last part to give out the loot bags. My colleague Annette Afrcano and boss Dulce Agnir requested for additional security around the garden and the stage area as this was where we decided to distribute the gifts. We made sure the children would form an orderly line. Then the moment arrived. It was at the Champagne Gardens on Dec. 7, 1996. I was surprised to see him walking towards us, guided by his aide. Michael came up to me as I had to brief him. "Hi, how are you? Thanks so much for letting me in, I know I'm early 'cause I didn't want to miss the program." I said, "Are you kidding? Thanks so much for volunteering! Here's what Michael - why don't you just sit here and watch the musical numbers before we get into the gift giving. I will have to tweak the grogram a bit. He replied, " Sure, anything you say... (pausing to look at my name tag) Gwen!" I was stunned at how incredibly sweet and modest he was. And in my mine it was, "Oh my God, this is really happening!" Amazing how he patiently sat through the whole grogram. Carol Banawa, then an "Ang TV" mainstay couldn't believe MJ was watching her perform. She had her red blouse signed by him right after her number. Then followed Stefano Mori's dance number. Later, his back up singers and dances came up on stage followed by selected kids from different orphanages who danced to the beat of 'Billie Jean'. Oh, the smile on Michael's face was just amazing. Then we announced that Michael will be distributing gifts onstage. I explained to him that there's a loot bag for the younger kids and another for the older ones and he noded. The thrill and excitement he gave those children was incredibly touching. It was in between the gift bag distribution that I caught a glimpse of MJ, not as a performer but as a person. It was one in the afternoon. Santa Claus (David Endriga, a friend of fellow PR officer Francis Capistrano) was with us. The heat was scorching and I was worried that Michael felt so hot with his black long-sleeved signature attire and hat. "Are you alright Michael? We can let you take a break," I asked. He said, "I'm cool, Gwen. Just imagine how Santa feels inside his velvet suit and beard. We'll be fine." I never heard him complain or say a word about how hot it was or how long the line was. He had the most beautiful manners. He didn't even ask for a drink or a towel to wipe his sweat but one of our banquet staff made sure he got a glass of fresh orange juice. An hour passed and we were halfway through gift-giving when we notice that the garden was getting filled up. Suddenly, there were people from media, politicians, officials and hotel guests, including those in a wedding reception at the nearby Champagne Room who deserted the newlyweds just to get a glimpse of the King of Pop. "OH, this isn't supposed to be, I'm so sorry," I said. "It's all right, we'll get through it," Michael said, smiling. As we finished giving out the last loot bag to an 11-year-old orphan, a new line of more kids and adults formed. Michael's bodyguard, Wayne, said. "We can leave now." Michael replied calmly, " We can't leave when there are still people in line. It's Christmas, dude." I felt my heart beat faster and the hair on my arms and the back of my neck stood up. He wasn't just the most electrifying performer, but the most generous person. One of the most memorable moments was when a lady came up to him for an autograph. Laughing and holding his tummy, he said "Hey Gwen, you've gotta check this out." He whispered, "It's a blank check. This lady is making me sign on a blank check." We laughed hard and little did we know that it wan't even half of the comedy. He later showed me and Wayne other stuff people would use or pick up on the ground when they couldn't find paper for him to sign on. One teenager came up to him holding a dead leaf and another one, a popped balloon. Imagine how our laughter ballooned as well. I was an amazing, genuine experience. At one point he asked if I was going to catch his History concert and I said, "Tomorrow night." "Oh, you'll have a blast!" Michael told me. At this point he became concerned about the stage as adults outnumbered the kids. His face had nervousness written all over it but he still didn't complain. He Tapped the wooden floor with his foot several times making sure it was sturdy enough not to fall apart. "I've experienced the stage collapse and I just want to make sure we're all safe here," he explained. Half of me wanted the line to finish because we were literally melting and worried about our safety, but half of me didn't, knowing that once the line ended, Michael would leave. At some point it did end. I managed to get an autograph for my sisters and me before our general manager, Clem Pablo, requested him to sing 'Give love on Christmas Day'. Cesar Sarino, one of the hotel's officials, addressed his thank you note to the King of Pop. Then I saw his guards and aides whisking Michael off stage. I said in my mind, "Oh man, I didn't even have the chance to say goodbye." Suddenly, I saw Michael return on stage and say, "Thanks so much to you and your team, Gwen. This really means a lot." Then he held me beside him and said, "I'll see you at the concert." As Michael Jackson is laid to rest and returned to pristine condition in the afterlife, these two incredible acts of the King of Pop - volunteering for charity and unselfishly spending time with the less fortunate - will forever be the way I will remember this man. Glad to know about this orphan’s Christmas party. Last year, on Halloween, I arranged a party with my friends at one of exquisite Seattle venues. Decorated venue with help of a reputed florist in city and had excellent time. Everyone loved food in party!